Editor’s note: In recognition of Global Patient Week, held annually across Bristol-Myers Squibb to celebrate the company’s patient-focused culture, we’re sharing how our People and Business Resource Groups are driving change for diverse patient populations. hen Priscilla Ko, a manager in the Bristol-Myers Squibb Foundation and member of the PAN Asian Network People and Business Resource Group, watched her father-in-law lose his battle with an aggressive form of bile-duct cancer at the age of 61, the personal suddenly turned professional. Rita Fawcett (center), of the cardiovascular field team, talks with PAN members, including Manisha Mahimkar (left) and Shalabh Singhal, who helped create training materials that shed light on important cultural insights. Ko, who works on the Foundation's Specialty Care for Vulnerable Populations initiative, began looking more closely at health disparities in Asian-Americans, Native Hawaiians and Pacific Islanders and realized there were significant hurdles in access to care. "Health disparities are often discussed alongside social determinants of health like unaffordable housing, food scarcity or lack of insurance," said Ko, whose father-in-law moved to the United States in 1987 from China. "But for some populations, there are also cultural determinants like language barriers and differing cultural traditions and beliefs." Another significant challenge that minority patient populations face is often they are underrepresented in critical healthcare conversations. At Bristol-Myers Squibb, members of the company’s eight People and Business Resource Groups – more than 12,500 members in total -- are setting out to ensure diverse perspectives and voices are not only included and heard, but that advances in health equity are made. PBRG members pictured from left: Charlotte Jones-Burton; Lisa Ying, Vidya Perera and Diptee Gajjar. In the U.S., the death rate for all cancers combined is 25 percent higher among patients who are black compared to patients who are white. Cancer is the leading cause of death for Asian-Americans, Native Hawaiians and Pacific Islanders (AANHPIs), namely due to the significant disparities in access to care. Veterans’ mortality rates for lung cancer are staggeringly high because of higher smoking rates among soldiers and exposure to other carcinogens from the environmental hazards of war. Women are more likely to die from their first heart attack compared to men often because of symptom presentations. Pictured: Silka Rodriguez, a tri-chair of the LGBTA People and Business Resource Group. Members of Bristol-Myers Squibb’s PBRGs are working to improve health outcomes across several disease states and populations through work both inside and outside the company. This includes reaching out and working with policy makers, patient advocacy groups and thought leaders from both academic and medical centers. The Black Organization of Leadership & Development recently hosted a roundtable discussion with black oncologists at the 2018 American Society of Clinical Oncology Annual Meeting to help identify the challenges of enrolling African American patients into clinical trials and other gaps in care. The PAN Asian Network this year held cultural sensitivity workshops to help U.S. sales force teams better understand the communities where they work. Senior leaders from the Bristol-Myers Squibb Network of Women have joined forces with other thought leaders in the industry to improve cardiovascular care for female patients. The Bristol-Myers Squibb Foundation is funding lung cancer screening programs at 10 Veterans Affairs locations in the U.S., working closely with the Veterans Community Network PBRG on the implementation and engagement of this initiative. 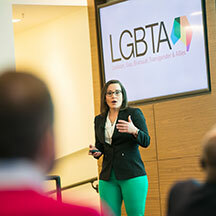 In the fall, members of the LGBTA will be raising awareness about health disparities among Lesbian, Gay, Bisexual and Transgender patients during a panel discussion for employees with physicians from the LGBT Health Program at Penn Medicine. As part of Hispanic Heritage Month, the Organization for Latino Achievement (OLA) has challenged its members to come up with new approaches to help recruit Hispanic patients for clinical trials. How does it feel when those who work for patients every day become patients themselves? Some of our colleagues discuss their own patient journeys. Chairman and CEO Giovanni Caforio reflects on the importance of Bristol-Myers Squibb’s Global Patient Week and why it exemplifies the best of our company culture. Bristol-Myers Squibb employees and patients explain in their own words what patient focus really means and how our work makes a difference.